One of my favorite works in the Portland Art Museum's permanent collection is John Wesley's simultaneously hilarious and wickedly dark painting, Battle of Przemysl. It's a sphynx like painting that may or may not be making a strange comment on; military expectations, conformity, homoeroticism, politics, the weird ideals of war, wartime music and historical head scratching all in one neat package with a thick black border. That border is not unlike Jo Baer's classic minimalist works, yet this work couldn't be more different than his former wife's work. Instead, it traffics in inference and fetishes the act of stalemate. Also, Battle of Przemysl is ambiguously dry and I like the fact that it is one of Wesley's war-related scenes, not one of his social bon mots (which are good but allow some people to mistake him for being something like a cartoonist in the New Yorker). breaking the plane and possibly signifying how ideas get tested in the real world). All the while, a pink soldier sneaks up from behind the procession with a knife. Notably, the soldier on the far right is gray, not colorful like the other figures for some reason. 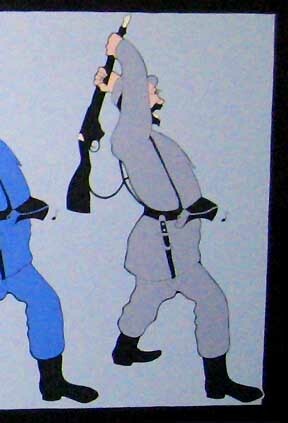 So is the gray soldier indicative of an active moment between colorful wartime expectations and even more colorful execution in history? ...the battle did become a movie. Or maybe it's the opposite, the waning gray figure symbolizes a once colorful pre-battle enthusiasm? Also, Wesley loves obscure title material so one assumes there is a reason he dug this obscure battle up. Historically, in the earlier parts of WWI the Battle of Przemysl was a harbinger of the Russian military's inability to ascertain their enemy's strength and the lurking revolutionary dangers that arose in 1917. Is that a prescient "commie pinko" soldier in hand to hand combat at the back of the line (also sporting a boot that breaks the black border)? Maybe. Was this a Vietnam piece? Maybe. Was Wesley siding with the prevailing strategic paranoia of the time that the communists could strike anywhere and needed to be contained? Maybe, maybe the opposite. Did he consider the ideas and goals of capitalism and communism in confrontation with each other as a way to emerge from constant conflict with a clear winner? but you'd be damned to tell what kind of deck he's dealing from. Instead, with Battle of Przemysl it's like he deals the viewer a Polaroid of 5 aces and a trivial pursuit card. How do you place a bet when dealt a hand like that? For me Wesley takes Aristotle's edicts about art and ambivalence and has a field day. Sure, Wesley's graphically reduced images on flat canvas planes look like pop art (Ruscha? ), the sequential and clean compositions parallel minimalism and there is something deadpan and Magritte-like in his association to surrealism. The only artist he actually reminds me of is Giacometti, whose similarly mute and haunted-ly ascetic work seems like Wesley's more serious older brother. it just ain't gonna happen but man is it fun to watch anyone try. or lesser local artist/comedians like Brad Adkins or Joe Macca who both traffic in a similar kind of up front obfuscation in response to the anticipation of anticipation, but Wesley's got more and better art jokes. Wesley also reminds me of Buster Keaton, but he's purposefully less entertaining. so much so I don't really think about the man, just the work. As luck has it Portland's Battle of Przemysl is a very good early Wesley... and though the Prada Foundation retrospective originally sought to include it... their momentary loss is our permanent gain. It is usually on display on the 3rd floor of the Portland Art Museum's Jubitz Center.